As an ex-Intelligence Officer, Phil uses the same intelligence principles to catch customers as he once did to catch criminals. He has a strong reputation for being Australia’s leading expert on Facebook Marketing. He has presented to thousands of business owners and marketers both nationally and internationally on the power of Facebook marketing. Phil McGregor is the founder of Ads Academy and AdChief, a father, husband, adventurer, international speaker, presenter and pioneer. Phil is passionate about sharing his first-hand knowledge of how to harness the true potential of Facebook Advertising. He shares the information via live-on-stage events, masterclasses and workshops. He does not just talk the talk, he walks the walk – daily. He actively works Facebook Ad campaigns every day. His clients constantly generate three to ten times return on investment. How to start a podcast and how to make it successful? The monetisation based on the number of listeners. Phil McGregor’s past background as a police officer. His past experience in analysing drug dealers' telephone bills. How he ended up starting his business saving clients money on their phone bills? The importance of targeting the right people. The importance and influence of having a Facebook page. The effect of using social media, particularly on the cost of doing business. Achieving goals through creating good content. Getting to your dream place as fast as humanly impossible. Podcasting as a way of attracting people to your business and engaging with them. Getting out there through advertisement. Finding the right people to do your podcast. Targeting the website visitors to increase conversions. It is not really a numbers game. It is about engagement and community. How is Facebook Marketing insanely amazing? The cookie and true identity. 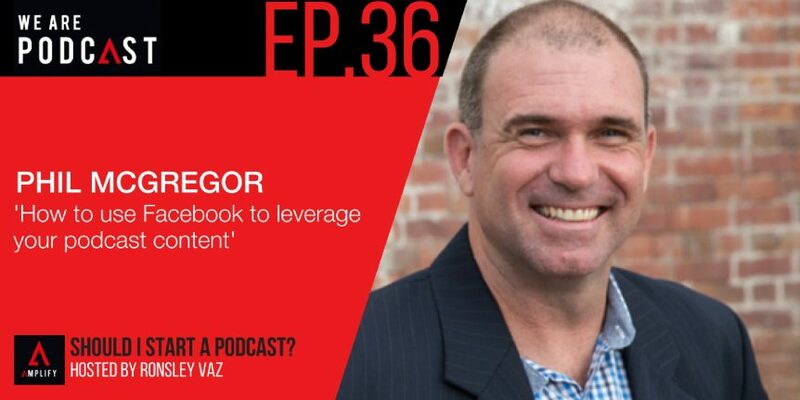 How can Facebook Pixel send people to your podcast and deliver the right listeners? Convincing people to find their purpose. If you have a 30-minute podcast, it is not a bad idea to chunk it up a bit into five-minute ones. You get more downloads for the same thing. Another tip I picked up, was to do five podcasts first. Do not publish them straight away. When you are ready to launch, have five ready to go. What are the most important things to consider in Facebook Marketing ? In the whole processes, one of the most important things is to make it cheaper and better. You can travel further to get more organic growth and get good content. Go through that process. Get good content and interview influential people. You will have a little, but a perfect vehicle to go well. Sometimes you need to advertise before you start. You need to get out there and have a go. You can really push it. You get that seed. Just like putting fertiliser on a literal seed and watching it grow a lot faster. You need to get out there and have a go. You can really push it. You get that seed. Just like putting fertiliser on a literal seed and watching it grow a lot faster. Make sure you always have a successful page. At the end of every event you are running, there’s should be some sort of ‘Thank You‘ and put the pixel on there. Makes it cheaper and more efficient.